Working on your 1982 - 1992 Firebird or Camaro just got much easier! 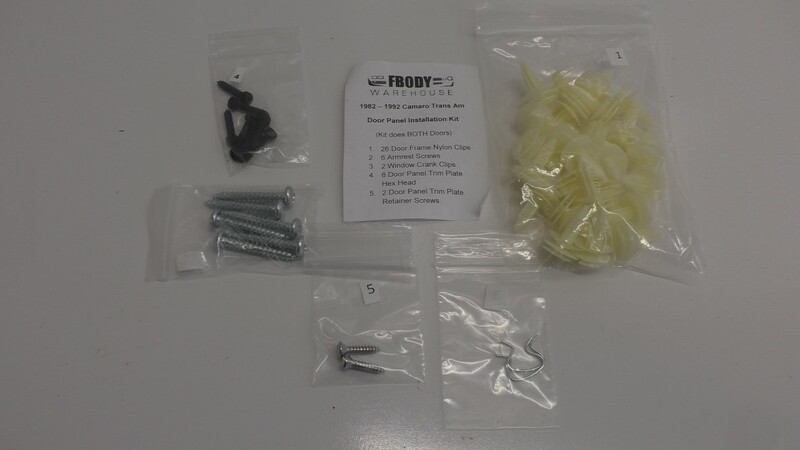 Fbodywarehouse is pleased to offer a custom kit to replace all of your worn, broken or missing door panel installation clips, screws and hardware. Kit does BOTH doors and comes with an easy to use SKU sheet and easy to read bags for a smooth and fast installation. At check out be sure to list your exact car year as some year kits vary in counts from other 3rd generation cars! For use on 1982 1983 1984 1985 1986 1987 1988 1989 1990 1991 1992 Camaro Firebird Trans Am. So be it just working on your doors, or installing new panels this is a must have kit and can only be found at Fbodywarehouse! 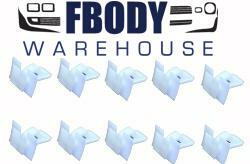 Fbodywarehouse door panel install kit for all 3rg generation door panels!